Next month we will attend our third Healthcare Information and Management Systems Society (HIMSS) Conference in Las Vegas, Nevada. 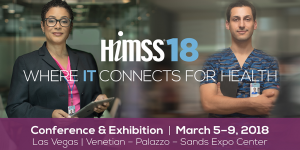 HIMSS 2018, one of the most anticipated events each spring, will take place this year from March 5-9th. The conference will cover Medical, Health Care, Information Systems, Information Management and Healthcare Informatics. Several Sparksoft leadership personnel will be in attendance, along with 45,000 other attendees and 1,300 exhibitors, including some of brightest minds in Health IT, offering invaluable networking and educational experience. Keeping in line with gathering some of the brightest minds in Health IT, Sparksoft’s CSO, former Deputy CIO and Director for CMS, and Office of Information Services, Henry Chao; CEO, Mike Finkel; and Senior Solutions Architect, Richard Toney, will be holding intimate speaking sessions at Sparksoft’s own booth, #11634. Each talk will run approximately 30 minutes, covering lessons learned in Healthcare.gov implementation and Testing as a Service (TaaS). To reserve a meeting date and time please contact Mary Fingerlin at mary.fingerlin@sparksoftcorp.com. As always, we look forward to this opportunity to foster the seeds of progressive collaboration with other team players in the Health IT space. We are excited for this year’s HIMSS Conference and Exhibition “where the world connects for health” and can’t wait to see you there.